Apparently, this mosque is the site of the first mosque that was ever built in the city in 640AD by the second caliph, Umar. The architecture of the mosque is heavily Ottoman. It has a square layout with 4 minarets and a marble floor. People often confuse this mosque for the 1924 Grand Al-Husseini Mosque; this one was built in 2005. It can accommodate 2500 male worshippers and 350 female worshipers in a separate praying hall. Also, inside is the Hashemite History Museum, which displays artefacts relating to the Prophet, including a famous letter that he sent to Hercules, the king of Byzantine. But even though you can visit inside, the best time to walk by the mosque is probably the night when it looks like a shining white jewel in the dark. Mon-muslims are not allowed inside during prayer times. When will have to wear a full black head to toe coloring before they are allowed inside. The coverings are provided outside the mosque. How popular is King Hussein Mosque? 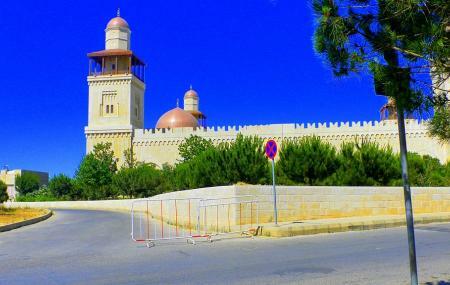 People normally club together Children's Museum and The Royal Automobile Museum while planning their visit to King Hussein Mosque. Amazing place. But people need to be more civilized and put there shoes neatly. Other than that one of the best places to visit. One of the most beautiful mosques in Jordan and what makes it more special is that it's named after our beloved late king Hussein. A beautiful place, but it is only open to visit at prayer times as the security guy told us.